Cutter Performance 160 cuts/m (150 cuts/yd) variable with forward speed. Easy to use, to maintain a perfect cutting edge throughout the season. High quality British blade and incorporate easy to set cutter adjustment. High quality British steel blades. Choice of bottom blade and incorporate easy to set cutter adjustment. Helps relieve surface tension and prevents thatch. Replaceable spikes relieves surface tension and allows penetration of air, water and fertiliser to the root zone. For turf ironing and final pre-match polishing. The ultimate verticutter with tungsten tipped blades for heavy duty usuage. 1mm thick, 10 fingered replaceable discs. Regular use controls thatch, lateral growth and the ingress of unwanted species such as annual meadow grass. 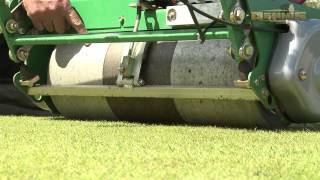 For moss and debris use as a light scarifier for final pre cut preparation. For moss and debris removal and use as a light scarifier for final pre cut preparation. 2mm thick replaceable, wear resistent blades. 12mm thatch removal throughout season and autumn/spring rennovation work. 1mm thick replaceable, wear resistent blades. 12mm spacing for thatch removal throughout season and autumn/spring renovation work. The FT510 is such a good quality mower, I would definitely buy another when we need one, if at all. I reckon this mower will last forever. noticeable difference within a month of buying it. We're over the moon. The FT510 is British Engineering at its best. Bob Carder, head of grounds at Stamford Endowed Schools in Lincolnshire, has praised his range of Dennis mowers for helping him keep on top of a busy work schedule. 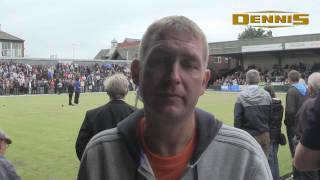 In 2014, St. Austell Bowling Club in Cornwall graced over 3,000 bowlers. 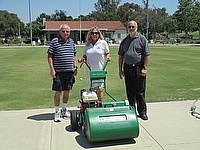 With such an inundated fixture list, only the finest turf maintenance machinery would make this possible and the Dennis FT510 ensured that the reputable bowling club could keep to their busy schedule. Derek Turner, greenkeeper at Liskeard Bowling Club in Cornwall, wanted to purchase a top quality cylinder mower that could manage the demands of a green that hosts 200 plus games per season. 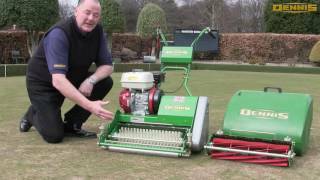 He put the question to fellow greenkeepers in the industry and there was only one answer - the Dennis FT510. 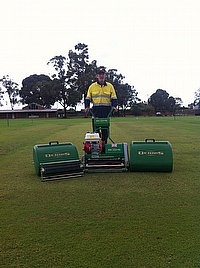 Ten years ago, Graeme 'Scooter' Wicks, managing director of Total Pitch Care in Perth, Australia, was looking for a high quality cricket mower. As a contractor with the task of maintaining a number of cricket venues, he needed a mower to keep the facilities in pristine condition. He found the solution on the other side of the world in the form a Dennis FT510 cylinder mower. Sports Turf Services (STS), one of Scotland's leading sports and amenity turf maintenance contractors has chosen Dennis as a key supplier of maintenance equipment. The contractor has recently purchased a range of Dennis FT510 interchangeable cassette mowers and Verticut TT machines. Managing Director Peter Campbell, who purchased the company in 2007, explained that they have used Dennis at cricket, bowls and golf clubs across Scotland for over twenty years. Ask greenkeeper Bill Mitchell to name the most impressive feature on his new Dennis FT510 mower and the response is immediate: â€œIt's the fact I know that it will last at least ten years. We've used Dennis mowers at the bowls club for many years and in that time we've never had a single issue, so when we were purchasing a new one, I knew that Dennis would stand the test of time." Brailsford Golf Club's Head Greenkeeper Andy Ryder has faced a most testing spring for his tees and greens in particular, but his two Dennis professional cylinder mowers have helped him cope and kept the club's 180 members happy at the tee and pin. For two years now, Andy has been using a 10-bladed Dennis FT510 with interchangeable cassettes for his tees and an 11-bladed Dennis Razor Ultra on the greens at Brailsford and he swears by them. 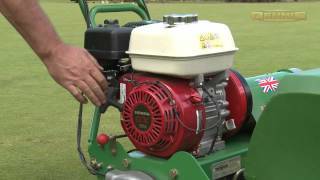 Watch this bowling green maintenance video with Bowls Scotland and the Dennis Mowers FT Series in action. The British Crown Green Bowling Association’s (BCGBA) Champion of Champion’s event, held at Waterloo Hotel, Blackpool last month, had a playing surface fit for the country’s best players thanks to the help of a Dennis FT510 mower and range of interchangeable cassettes.